Okay, so I’ll just say right up front that I hate horror films. I can’t stand movie gore (ironic since I’m A-OK with real-life gore in my day job as an RN) and for someone who deals poorly with stress and anxiety as it is, the thought of willingly subjecting oneself to that kind of tension is beyond comprehension. That said, I absolutely adored Until Dawn. Hey, no one is as surprised by this as I am. This interactive horror game from developer Supermassive Games combines a heavy emphasis on narrative, an element of sleuthing, and the promise of replayability via branching storylines to deliver one of the most thoroughly enjoyable games I’ve played this year. Is there gore? Oh absolutely. Jump scares? You’d better believe it. But the overall package is well-paced and balanced enough to overcome the trepidation of even the most faint-hearted gamer. Strap in and turn the lights off, this is going to be a fun ride. Until Dawn is that rare horror game that actually delivers a legitimately scary experience. I can’t guarantee you’ll be freaked out - everyone has different thresholds for this sort of thing - but I may or may not have yelped and/or involuntarily jumped more than once. Every aspect of this game is crafted to set the mood and build tension, from the gray tones and liberal use of shadows and darkness to the sudden jump cuts and the excellent sound design. The subtle build-up, the screeching violins, the indistinct whispers when you’re walking around alone in a pitch-black house - all of these factors collude to put the player on edge, perfectly positioning them to be taken advantage of by the next scare. To maximize all of the above I strongly recommend you do yourself a favor and play at night with all of the lights off. Preferably alone. The gameplay immediately gave me warm and fuzzy feelings as it very much recalls the survival horror style of Silent Hill and early Resident Evil games. You walk around, you talk to people, you find clues, you get the crap scared out of you when a baby wolverine jumps out from under a sink. It beautifully combines that old-ish school gameplay with impressively rendered graphics, resulting in a visceral experience that allows you to really immerse yourself in the story. The developers of Until Dawn have made great use of the PS4’s full technical capabilities, delivering a gorgeously-rendered game containing some of the best motion-capture work I’ve ever seen in a video game. I’m normally not a big fan of shoehorning screen actors into video games but in this instance it’s been incredibly well done. Until Dawn’s system of branching storylines revolves around the “Butterfly Effect,” the main thrust of which is that very small decisions made in narrow circumstances combine and amplify to create significant changes to the overall story. The game is fairly unforgiving when it comes to the player’s decision-making; the split-second timing of how choices are made and the intervals in which the game autosaves more or less ensure that your immediate knee-jerk reactions will be locked in. Some of the consequences of these choices are fairly obvious while the significance of others might not be revealed until much later in the game. The fact that you don’t always know what sort of weight each individual choice could potentially carry keeps the stakes high and the player on their toes from beginning to end. A nice feature integrated into the game is the ability to review some of your choices in the “Butterfly Effect” menu and trace the consequences of those decisions as the story unfolds. I can’t really talk specifics here without spoiling the story, but rest assured that the way in which the overall arc slowly unfolds is nicely drawn out and solidly well-executed. The bulk of the gameplay takes place in long flashbacks presented as episodes, each representing the events of a given hour before dawn and is told from constantly shifting character perspectives. The general “who’s going to survive? ?” element of a typical horror story is of course there, but the way in which the overarching story slowly reveals itself over many hours of gameplay demonstrates impressive restraint and skillful pacing on the part of the designers. 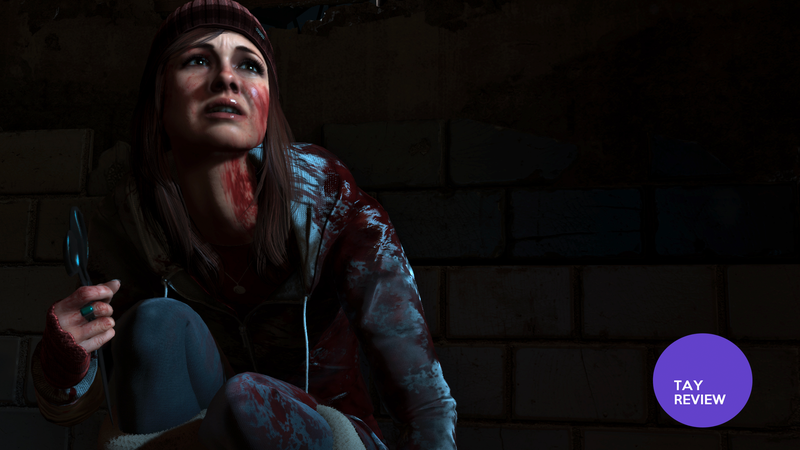 Until Dawn’s branching storyline system ensures that the game possesses a high degree of replayability. This is fantastic news for completionists or those who find themselves fully invested in the story and characters; others might not find sufficient motivation to make use of the game’s replay potential. As with other narrative-heavy games if you actually embark upon another run you’re going to have to work through a whole lot of fluff in order to get to those key moments that can materially change the course of events. In the age of YouTube I’m not sure how many players are going to have the stomach to replay the entire game for the purposes of comparison alone, particularly once the central mysteries have been solved. The other issue that may prevent players from exploring the game’s full replay potential is the fact that, simply put, some of the characters may not be worth going back for. This was a somewhat irritating group of friends to work with, and I personally had a hard time caring about the fates of individual characters. When they say quicktime events, they mean quick. This game does not screw around: if under extreme pressure you can’t press the correct button within a second, don’t even bother. The fact that that insidious “tick-tick-tick” sound effect comes blaring through the speaker on the PS4 controller only adds to the sense of urgency. Overall the game makes unusually good use of the PS4’s touchpad, utilizing the feature for intuitive actions like turning pages in a book, striking a match, or closing the shutters in a creepy old cabin. The developers have also taken advantage of the controller’s full capabilities by integrating moments where you have to remain absolutely still, a nice touch that immensely adds to the player’s sense of immersion in the game. In a cabin on a snowy mountaintop, young adults are terrorized and picked off one by one by a mysterious aggressor. As well as the storytelling is handled, the bulk of the story itself isn’t exactly groundbreaking stuff. That’s not to say that there aren’t some pretty great twists and reveals along the way which I won’t spoil for you, but it’s hard not to acknowledge that the setup is pretty stereotypical for the genre. Until Dawn is an innovative entry into the category of player-driven games, and the knowledge that there are so many different paths to take results in a game with an incredible degree of replayability. Beautifully realized and atmospheric, the horror tone was perfectly set from beginning to end. The story, while not groundbreaking, was wonderfully paced and never let up on the tension. Even if you don’t generally care for horror as a genre, those who can appreciate a well-told story driven by player input should definitely give it a try. If horror games are your jam, then you’re in for a real treat. Nicole T (street name: Barkspawn) lives in California and firmly believes that Resident Evil 2 is one of the greatest video games ever made. You can find her on Twitter @ser_barkspawn, contact her here, and read more of her articles here.